It’s all true–and weirdly, it opened -after- I wrote my theme park article. It lasted only a season or two. I covered it (with photos) in Apatoons at the time. Just an update, the park after 20 years left rotting, vandalized, and legally trashed by the state of NH DOT is finally reopening as a city passive recreational park on Memorial day 2010 after many years of clean up. The gorilla house is still there, the elephant barn, the main office and the old lady of the shoe red shoe. Sadly between the vandals and the state DOT many of the land mark buildings are now gone due to ignorance and criminal acts of destruction and arson. We are looking forward to family’s creating new wonderful memories in a all new kind of family park. The park also has a VERY active page on Facebook with some awesome photos from the past and present. live near this park. When it took on a Terrytoons them in 1987, Mighty Mouse, Deputy Dawg, Sad Cat, Heckle and Jeckle, Pearl Pureheart, Hector Heathcote, The Terry Bears, and Lariat Sam were all used in large, colorful, well drawn signage around the park. Posters of Deputy Dawg, Possible Possum and others were for sale. 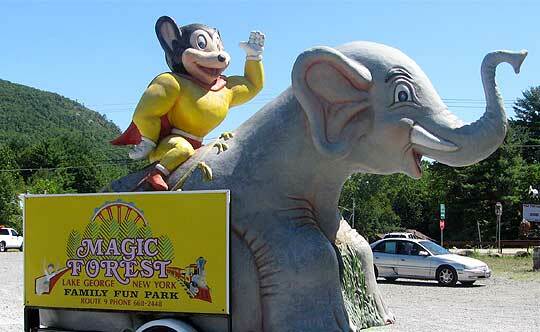 Sadly, the new park only lasted one year. For many years after, a huge Heckle and Jeckle sign hung in a nearby flea market at the snack bar.